Zydeco can be heard across the U.S. and worldwide today, thanks to extensive touring by artists like the indefatigable Buckwheat Zydeco. But here are the best places to hear zydeco. 1. El Sid-O’s Zydeco & Blues Club. 1523 N. St. Antoine St., Lafayette, LA 70501. (337) 237-1959. Celebrating its 30th anniversary in 2015, Sid Williams’ club is the home of zydeco in Lafayette. Sid’s baby brother is Nathan Williams. 2. Blue Moon Saloon & Guest House. 215 E. Convent St., Lafayette, LA 70501. (337) 234-2422. Known for its Wednesday night Cajun jam, the Blue Moon also hosts Creole and zydeco artists, like Jeffrey Broussard and Cedryl Ballou. It’s almost more fun than the law allows to dance in front of the stage. 3. Mid-City Lanes Rock ‘n’ Bowl. 3016 S. Carrollton Ave., New Orleans, LA 70118. (504) 861-1700. Thursday is zydeco night at Rock ‘n’ Bowl, with all the best bands playing at one time or another, like Geno Delafose. 4. 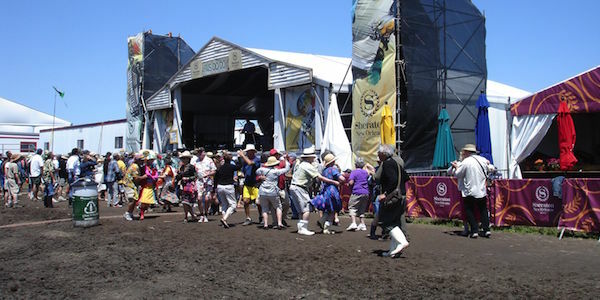 Festivals Acadiens et Créoles. A free outdoor music festival in Lafayette, Louisiana’s Girard Park, held annually in October. Five stages run music almost continuously from noon to dark for two days. 5. New Orleans Jazz & Heritage Festival. Hang out stage right at the Fais Do-Do Stage to dance your shoes off! You’ll hear the best zydeco and Cajun artists over two weekends in late April and early May. Bonus points for attending their Cajun & Zydeco Festival in New Orleans, held the first weekend in June. 6. Original Southwest Zydeco Music Festival. Held outdoors in a soybean field near Plaisance, LA, this festival presents only zydeco music. Dancers come from all over for this one, but be sure to drink plenty of water! 7. Festival International de Louisiane. Another free festival in Lafayette, the same time as the first weekend of Jazz Fest, creating a conundrum or an opportunity, depending on your viewpoint. Zydeco is not the focus, but is included, making it easier to get to El Sid-O’s and the Blue Moon while you’re in town. 8. Wherever touring artists play in your area. 9. Your home. Adding zydeco recordings to your collection supports the music today and for the future.